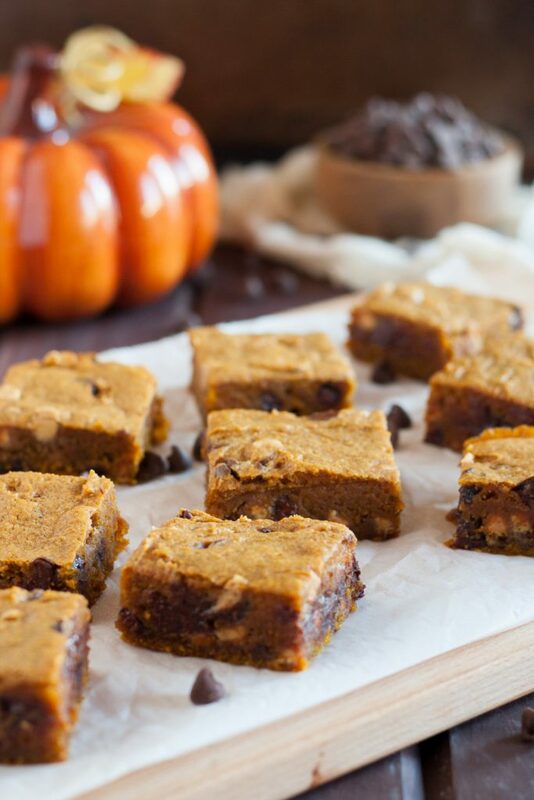 Peanut butter pumpkin blondies are a delicious alternative to brownies in the fall. 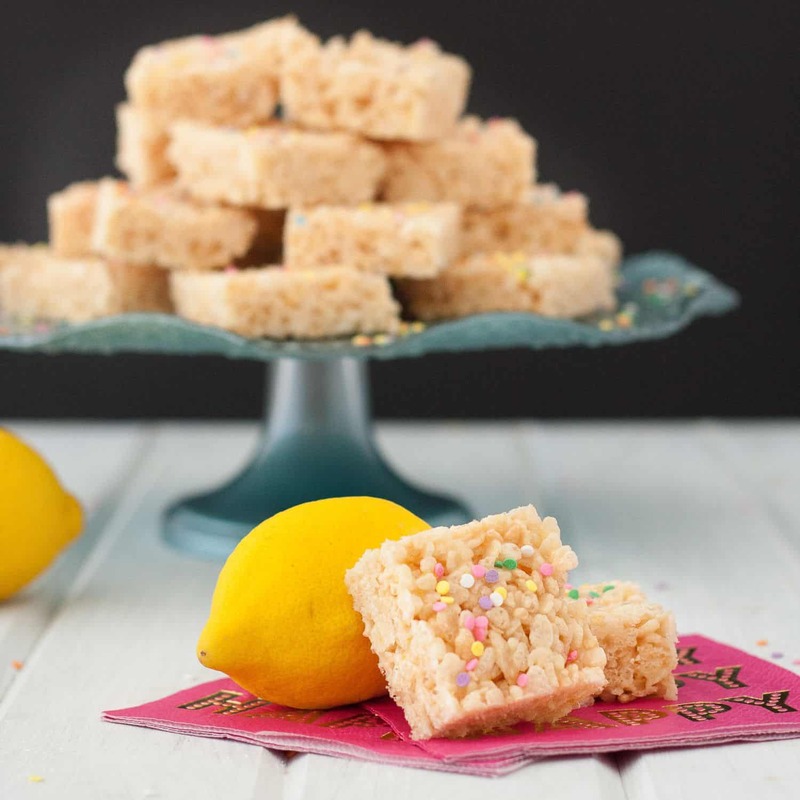 Festive, and easy to make, they’re a great gift or easy dessert. 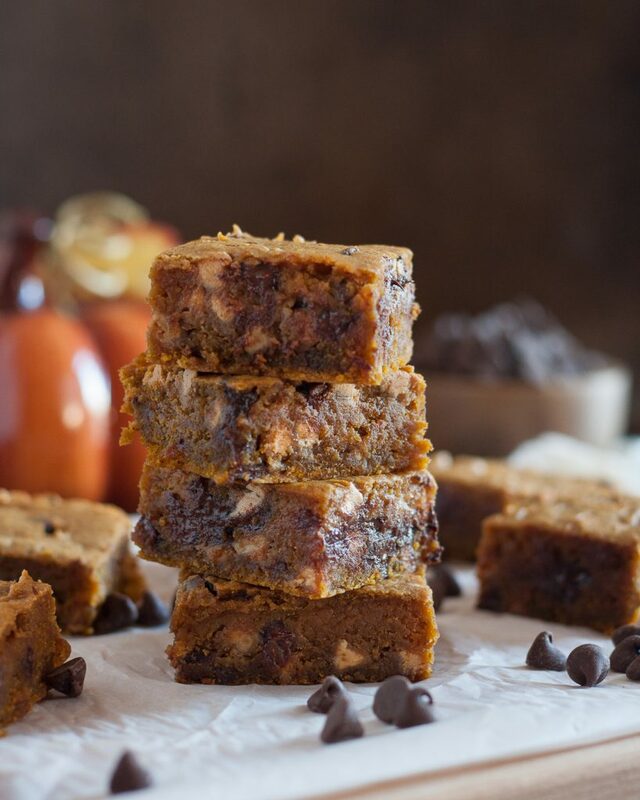 Strange as it sounds, you may thank a protein smoothie for this peanut butter pumpkin blondies recipe. I was on a pumpkin mocha protein smoothie kick for about a week, and the only can of pumpkin I could find in my cabinet was one of those monster cans that has enough puree for 2 pies. Given that I don’t drink a protein smoothie every day, and that each smoothie only requires a bit of pumpkin, I had quite a bit leftover. Which could have become something healthy, but why? It would throw off our fabulous balance. And I’ve also really wanted brownies recently. This is the perfect solution! 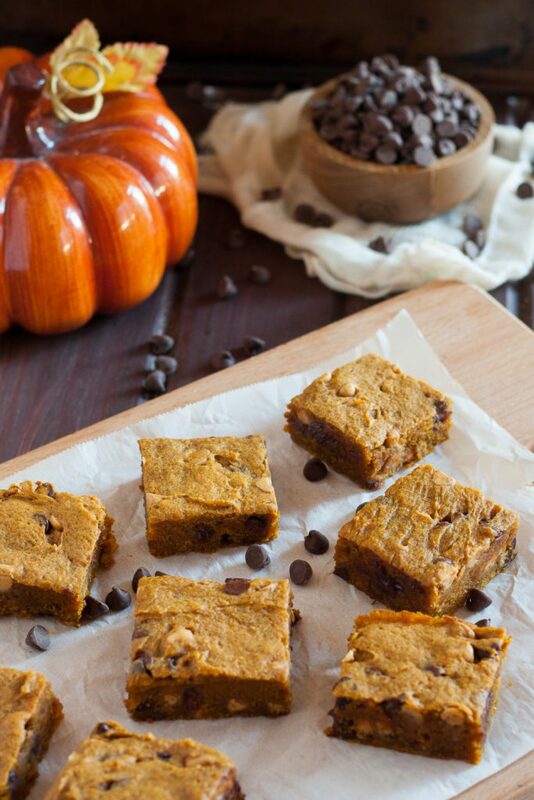 These pumpkin blondies are so addicting, especially when warmed oh-so-slightly before eating. They’re also egg free, partially designed for a friend with allergies. Now, I did include peanut butter chips in this particular batch, but I made another without peanut butter for an event and it was equally fabulous. I’ll include the details for that version in the recipe notes. I mention it because I think you should totally feel free to customize. 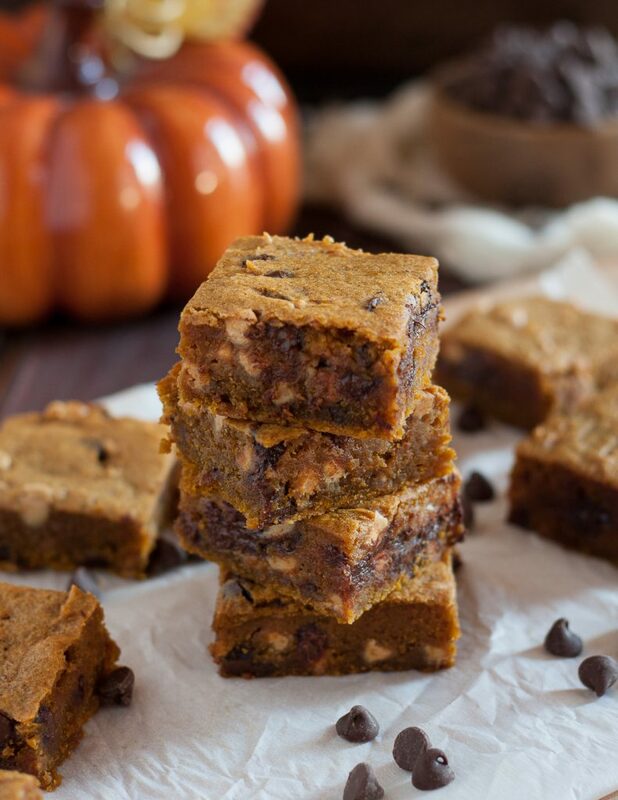 These peanut butter pumpkin blondies are definitely for the fudge brownie lovers. They’re dense and chewy, only slightly cake-like, and loaded with lots of pumpkin spice flavor. You may opt to use either a store-bought pumpkin spice mix or make your own with a recipe like this one from Byron at Pretty Practical Pantry. I’ve done both depending on my mood, so do what makes you happy. Another slight modification I made from my original inspiration (found over at Brown Eyed Baker) was to brown the butter. It’s an optional step, but I really feel it adds a lovely touch to the final result and just the slightest bit of nutty flavor. It pairs so we ll with the pumpkin flavor too. The blondies keep well for a few days at room temperature or refrigerated in an airtight container, but I feel they’re best within 3 days. I don’t think they’ll last that long, I made two batches in as many days and everyone loved them! Enjoy, darlings! 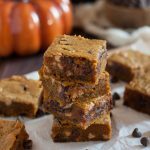 Easy to make pumpkin blondies loaded with flavor and perfect for fall! Using a skillet set over medium low heat, brown the butter. To brown butter, simply melt it, stirring occasionally, until small brown flecks appear and it smells nutty. Remove from the heat immediately and transfer to a small, shallow bowl. Set aside. Preheat your oven to 350 F (177 C, gas mark 4) and line an 11x13" pan with parchment paper. Spray with nonstick spray. Set aside. In a medium mixing bowl, sift or whisk together the flour, pumpkin spice, baking powder, and salt. In a large mixing bowl or the bowl of a stand mixer, mix together the brown sugar, pumpkin puree, and yogurt. Stir in the browned butter. 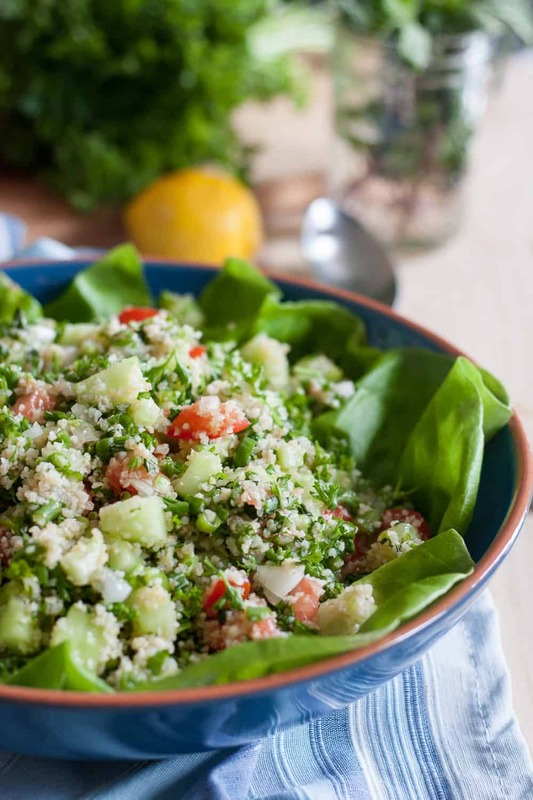 Add the dry ingredients to the wet in two batches, scraping the sides of the bowl after each addition to ensure it's all fully incorporated. Then fold in the chips or any mix-ins you are adding. Spread the batter (it's thick!) evenly in the baking pan and bake for 35 minutes until the edges are just set and a tester comes out clean. Remove from the oven and allow to cool in the pan on a rack at least 20 minutes before slicing. To make a peanut free version, replace the peanut butter chips with something else! White chocolate chips or toffee chips would be great alternatives. The most recent variation I made included candied pecans, the caramel bits you find in the baking section, and chocolate chips. Do what makes you happy! 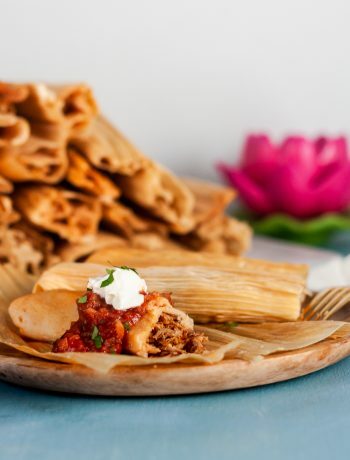 I made these this past weekend and they are a hit at the office. The ingredient list does not call out brown sugar but the recipe does. I added 1-1/2 cups of brown sugar and they are fine. Thank yo for sharing!!!! Thanks for pointing that out! I use brown sugar as well and will update the ingredient list to reflect that. I’m glad you enjoyed! Yes, and I just realized that didn’t make it into the ingredient list, so fixing now.